ABC Family will ring in the New Year with the world premiere of a new one-hour original drama series, Jane By Design, and with all-new episodes of returning original hit drama series Switched at Birth, Pretty Little Liars and The Lying Game, all set to premiere the first week of January 2012. 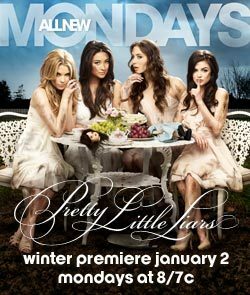 The girls are ready to kick some "A" in all-new batch of episodes from the second season of ABC Family's blockbuster hit original series Pretty Little Liars, returning on a new night, Mondays, starting Monday, January 2 at 8:00PM ET/PT. The Lying Game will return with all-new episodes to round out its first season on Monday, January 2, at 9:00PM ET/PT. The series comes from the producers of Pretty Little Liars and will now air back-to-back with that series! ABC Family's big summer hit, Switched at Birth, returns with all-new episodes to round its freshman year on a new night and time, Tuesdays at 8, starting Tuesday, January 3. Then Jane By Design will make its world premiere on Tuesday, January 3 at 9:00PM ET/PT. The new drama follows Jane Quimby (Erica Dasher), a quirky teen with an eclectic chic fashion sense, who lands a job at a hip fashion house when they mistake her for an adult. And finally, fan favorites The Secret Life of the American Teenager and Make It or Break It will both return with all-new original episodes in early Spring 2012, to round out the original drama schedule. We will have a comedy update soon, as Melissa & Joey will return for a second season after airing 30 episodes in the first season (in two halves), and possibly another new comedy or two, as we hinted earlier this week. For the week of November 7-11, 2011, we have many current sitcom stars and past sitcom stars on TV talk shows! All times listed are Eastern. So get your DVR's (or whatever you use) ready! Ready? Here is all what you need to know for the coming week! Melissa McCarthy (Mike & Molly) - Watch the Emmy winner Melissa on The Late Show with David Letterman at 11:35pm on CBS. Florence Henderson (The Brady Bunch) - Florence is a guest on Tavis Smiley on PBS, but check listings for time. Christina Applegate (Up All Night/Samantha Who?/Married with Children) - Christina appears on NBC's Today between 7-9am and later chats with the ladies of The View on ABC at 11am ET/10am CT-PT. Jason Segel (How I Met Your Mother) - Catch Jason on The Tonight Show with Jay Leno at 11:35pm on NBC. John Lithgow (3rd Rock From the Sun) - John chats with Tavis Smiley on PBS, but check listings for time. Julie Bowen (Modern Family) - The lovely Julie visits Conan at 11pm on TBS. Kelsey Grammer (Frasier/Cheers) - Watch Kelsey on The Tonight Show with Jay Leno at 11:35pm on NBC. Sarah Hyland (Modern Family) - Catch Sarah on The Tonight Show with Jay Leno at 11:35pm on NBC. Kathy Griffin (Suddenly Susan) - Kathy drops by Late Night with Jimmy Fallon at 12:37am on NBC. Josh Charles (Sports Night) - Josh appears on Late Night with Jimmy Fallon at 12:37am on NBC. Mindy Kaling (The Office) - Mindy is a guest on Chelsea Lately on E! at 11pm. Joel McHale (Community) - Joel stops by Conan at 11pm on TBS. Cheryl Hines (Suburgatory/Curb Your Enthusiasm) - Tune in to see Cheryl on Conan at 11pm on TBS. Please help us get Amy Davidson on Suburgatory! Florence Henderson (The Brady Bunch) - Florence chats with Rosie on The Rosie Show at 7pm on OWN. Whitney Cummings (Whitney) - Catch Whitney on The Tonight Show with Jay Leno at 11:35pm on NBC. Molly Shannon (Kath & Kim/Cracking Up) - Molly visits the Late Late Show with Craig Ferguson at 12:37am on CBS. Melissa McCarthy (Mike & Molly) - Melissa continues to make the rounds on The Ellen DeGeneres Show, so check listings. Drew Carey (The Drew Carey Show) - Watch Drew on the Late Late Show with Craig Ferguson at 12:37am on CBS. Miranda Cosgrove (iCarly) - Catch Miranda on a repeat of Chelsea Lately on E! at 11pm. Ana Gasteyer (Suburgatory) - Ana appears on The Rosie Show at 7pm on OWN.